Steve Curtis, Editor of IBD Brewer and Distiller International magazine visited Ragus HQ and our new Production Facility in 2015. He was on a fact-finding mission in connection with an upcoming technical article to cover all aspects of the production of brewing sugars from raw materials to packaging. His comprehensive report is now published and available here to download. Detailed and informative it focusses on pure sugar as an essential part of the brewing and distilling industries. It also provides an excellent insight to Ragus operations highlighting our many years experience and knowledge in the manufacture of specialist sugar products. 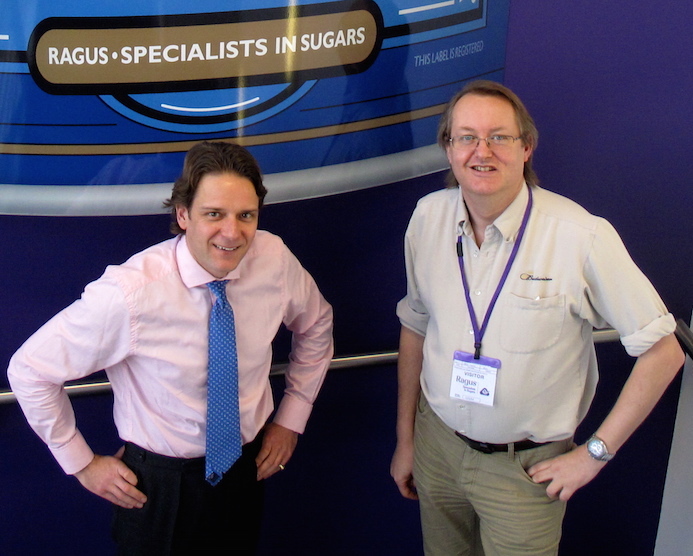 Ben Eastick, Ragus Marketing Director with Steve Curtis, Editor of IBD Brewer and Distiller International. The Ragus Production Facility tour began with a briefing on Ragus’ 87 year history and the range of brewing sugars supplied today.